Today, over one-half of graduating high school seniors enroll in institutions of higher education. Each Summer thousands of students leave home for the University of Oklahoma. Typically highly motivated, God has gathered these young men and women in one location, the university campus. It truly is a missionary’s dream! They “speak” a common language, live in close proximity, are young and most have yet to make major life decisions concerning friends, careers, marriage and values. Over 2,000 international students from over 100 countries come to OU. OU has more national merit scholars than any university in the nation. Pew Research indicates 67% of college students with a church background never connect with a church or Christian group after leaving home. There is possibly no greater mission field in Oklahoma than the OU campus. What a phenomenal opportunity God has given the BCM to share Christ with unbelievers and to enlist and disciple those who know Christ. The International Mission Board of the Southern Baptist Convention states there are more missionaries serving from the University of Oklahoma than from any state school in the nation. Proximity affects ministry. This new building will be located adjacent to the dormitories, most of the fraternity and sorority houses, and within blocks of student apartments. As missionaries to OU’s campus, BCM could not dream of a better location. 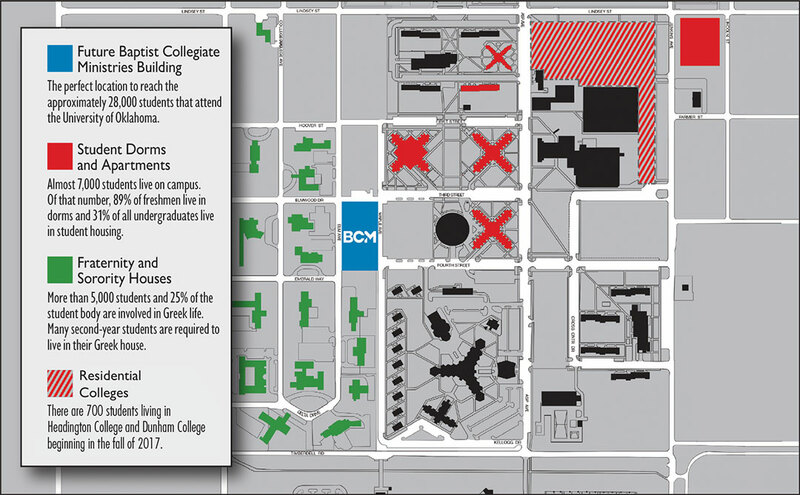 The new BCM building will enable us to have instant access to more than 6,000 students: where they live, where they eat, and where they study. How many places in Oklahoma have this many 18- to 22-year-olds living in such high concentration? 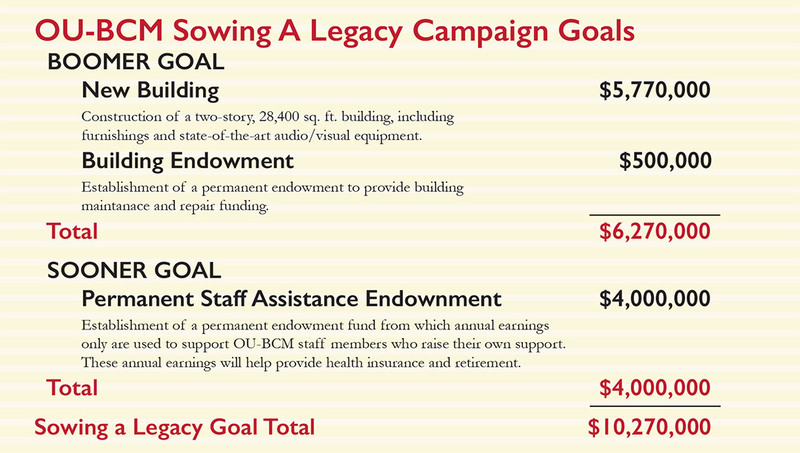 This is an investment in the future and an opportunity to sow a legacy of dedicated Christ-followers from the OU campus! This building will provide much-needed space for prayer, Bible study, worship, training, friendship, mobilization, and fun. The large open meeting space can be configured into smaller rooms for breakout sessions. The entry will feature a coffee shop where students and alums can gather for fellowship, or spill out onto an outdoor patio where music and other opportunities will enable the BCM to play host to the university community. This new location will be a visible witness to students, and will be a game-changer for Oklahoma Baptists to serve as a base of operations to reach the OU campus consistently and effectively. It takes more than a building to have a great ministry. It also takes a great staff. Staff members are needed to train students to witness in dorms, fraternities and sororities, among international students, faculty and staff, and athletes. OU has students in so many groups that need to be invaded with the Gospel. It takes quality staffers to do that and to disciple believers to become disciple makers themselves. The majority of BCM staff members at OU raise their own support. An objective of this campaign is to help these staff members by establishing a significant endowment to provide assistance with health insurance and retirement. Funds provided for this endowment will never be spent, only the annual interest earnings will be used for staff assistance. It is so difficult for young staff members to raise all the money for their salary, plus insurance and retirement. God has given us an open door at this time to leave a legacy He can greatly use through a new strategically located building and through helping to ensure continued quality Baptist Collegiate Ministry staff at The University of Oklahoma.